LEESVILLE — Even though winter weather has arrived in North Central Ohio, that doesn’t mean the fun and events stop at the Crawford Park District. There is plenty to do this time of year. 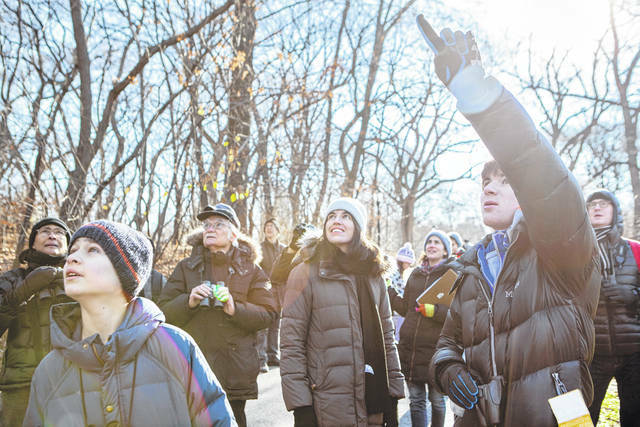 Here is a list of upcoming events, including the annual Audubon Christmas Bird Count, which is Jan. 5, 2019. Those who wish to take part in the upcoming march should meet at Bob Evans in Bucyrus at 7 a.m. that day. For more information on the Audubon Bird Count visit the Audubon Society website. Just Hike It, Saturday, Dec. 15 at 10 a.m. at Lowe-Volk Park: There are many benefits to getting outside and taking a hike, such as lowering your blood pressure and cholesterol, to increasing happiness levels and curbing depression. Plus there is always something new to see! Join us on our monthly treks through the parks. We will also be doing photo journaling to document how the parks and trails change from season to season! Nature Hike. Sunday, Dec. 16 at 3 p.m. at Sears Woods: Each winter brings with it a new set of challenges for all life forms. Food supplies vary from year to year and of course the weather patterns play a key role in determining the makeup of winter bird communities. Meet Warren Uxley at Sears Woods State Nature Preserve and find out what this winter will bring. Wild Wednesday, Dec. 19 at 10 a..m. and 2 p.m. at Lowe-Volk Park: Come to the Nature Center and enjoy an hour of nature exploration! Program topics will vary and may include a story, short hike, craft, or a visit from an animal. For pre-schoolers and their parents. Come dressed for the weather. Movie in the Park, Friday, Dec, 21 at 5:30 p.m. at Lowe-Volk Park: Wear your pajamas, bring your pillow and blanket, and settle in for a couple holiday classic cartoon movies. We will have an activity, popcorn to snack on and hot chocolate. Homeschool in Nature: Nature Knows, Thursday, Jan. 3 10 a.m. and 2 p.m. at Lowe-Volk Park: This month we are going to divide up into teams and play a trivia game. How much do you remember from earlier classes or how much do you already know? Classes are limited to 20 students per session. Please call the Park District to reserve a spot for your 5-12 year old by January 2. Trivia Time, Friday, Jan. 4 at 5:30 p.m. at Lowe-Volk Park: It’s National Trivia Day and what better way to celebrate than to have a competition over nature! Come out and pick a team. You will earn points for correct answers. The team with the most nature knowledge wins! All ages welcome. Audubon Christmas Bird Count, Saturday, Jan. 5, Meet at Bob Evans in Bucyrus at 7 a.m.: The classic example of citizen science, the Audubon Christmas bird count collects data on bird populations throughout North America. Those who wish to participate should meet Warren Uxley at the Bob Evans in Bucyrus at 7 a.m.